Stones in the kidney are hard masses of minerals and salts that form in your kidneys but may pass through the urinary tract, and for the rest which doesn’t pass through your urine, you need to take proper medication to remove the same. Ureters, kidneys, urethra, and bladder are included in the Urinary tract. Passing kidney stones can be a painful experience as it is one of the most painful medical problems. 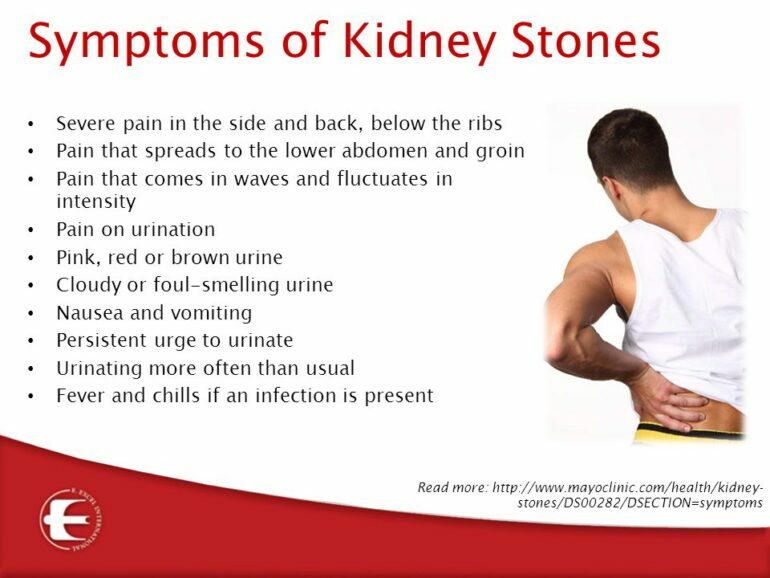 From a report, it is found that one in every 20 humans, at some point of time in their life, develops kidney stones. Renal colic, commonly known as kidney stone pain, is one of the most merciless pains. When a person suffers from such pain, they compare it with getting stabbed with a knife or a childbirth pain. Usually, this pain starts due to its movement in your narrow ureter. The pain comes and disappears. You will feel the pain in the lower back and on the side or below your ribs. The pain moves like the moving stone in your body. Larger stones can be more painful than the smaller ones. But this doesn’t mean that severity of the pain will be low as a little stone can also result in blockage. When the stone reaches between bladder and ureter, then you start feeling pain in your urination. The pain will make you feel like burning. If you don’t realize it as a kidney stone, then there is a probability that you will consider it as urinary tract infection and it is also possible that your doctor treats it as dysuria. When it becomes very urgent to go to the washroom at frequent intervals and you are unable to control your urine then it is also a sign that stone is moving in your urinary tract. Sometimes you may find yourself running into the bathroom and needing to go less than the usual time throughout the whole day then it is a sign of kidney stone. Blood in the urine is the most common symptom that is found in the humans suffering with kidney stones. It is also called as hematuria. The blood can vary in colors which can be brown, red or pink. Cloudy or smelly urine is also another sign of kidney infection or another part of the urinary tract. In a study, it was found that almost 8 percent of humans suffering from kidney stones had urinary tract infection. Cloudiness is a smell that comes from the bacteria in your urinary tract infection and it is a sign of pus in your urine which is also called as pyuria. Nausea and vomiting are common for people who are suffering from the kidney stones; they can easily upset your stomach. It can create an intense pain in your body. These symptoms occur in the human body due to the network sharing connection between GI tract and kidneys. Fever which occurs from kidney stones’ infection or through any part of urinary tract will usually be high and it can bring serious complications to your overall body. Chills or shivering occurs generally with the fever and this situation requires proper medication. If a person suffers from the above symptoms, then immediate and proper medication is required on an urgent basis. Consult with an experienced doctor for the treatment of your kidney stones and follow his instructions to cure yourself.